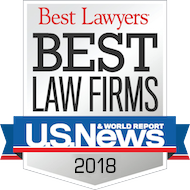 U.S. News and World Report recently announced its “Best Law Firms” and “Best Lawyers” of 2016, recognizing Pittsburgh-based construction law firm Dingess, Foster, Luciana, Davidson and Chleboski (DFL Legal) for the fourth straight year. DFL Legal’s recognition as a 2016 “Best Law Firm,” includes a Pittsburgh Metropolitan Area Tier 1 Ranking for Construction Law, Construction Litigation and Commercial Litigation. In addition, John Dingess, Joseph Luciana, Brian Davidson and R.J. Chleboski received “Best Lawyers” designations in areas including Construction Law, Construction Litigation and Commercial Litigation. Dingess was also named the Pittsburgh metropolitan area “Lawyer of the Year” for “Bet-the-Company” Litigation. These recent acknowledgements are based on exhaustive and rigorous peer reviews. DFL Legal continues to be recognized on local, national and international levels as a premier law firm specializing in engineering and construction matters.